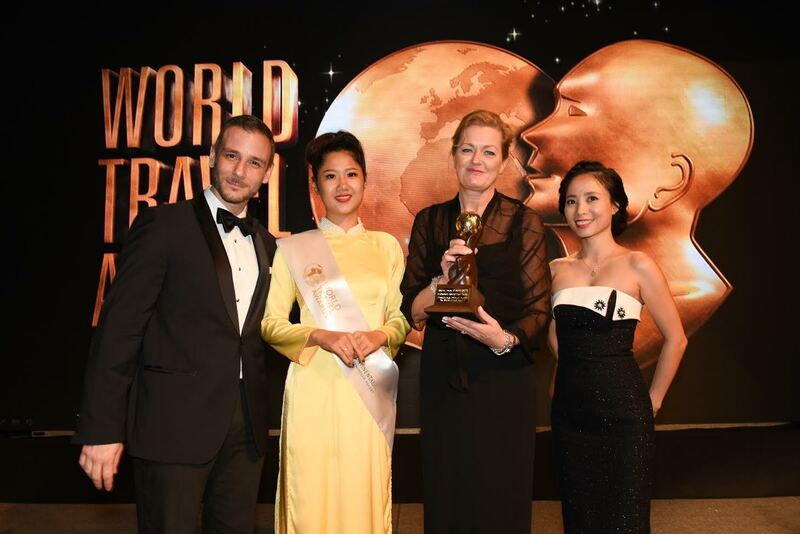 Etihad Airways’ General Manager for Australia and New Zealand, Sarah Built, accepts the award for Australasia’s Leading Airport Lounge from event hosts Greg Ohan (left) and Mai Anh Du (right). Etihad Airways’ Premium Lounge at Melbourne Airport has been voted Australasia’s Leading Airport Lounge for 2016. The announcement was made at the 23rd Annual World Travel Awards Asia and Australasia Ceremony in Danang, Vietnam on 15 October. Etihad Airways’ Chief Executive Officer, Peter Baumgartner, expressed delight at the win, the airline’s first ever at an Asia and Australasia World Travel Awards ceremony. “This award is a powerful endorsement of the superior quality of our Premium Lounge at Melbourne Airport and the hard work and commitment to excellence of the team. “It attests to the competitive benchmark we have set in Melbourne and the high level of guest satisfaction with the world-class hospitality experience we deliver. The award for Australasia’s Leading Airport Lounge is one of the many the airline has received throughout 2016. Only last month, its new First Class Lounge and Spa at Abu Dhabi Airport was voted the Middle East’s Leading Airport Lounge at the Middle East World Travel Awards. Etihad Airways has a collection of 15 airport lounges worldwide. This includes the flagship First Class Lounge and Spa in Terminal 3; Premium Lounges in Terminals 1 and 3; a Premium Lounge within the unique US Customs and Border Protection facility; and a Premium Arrivals Lounge – all at Abu Dhabi Airport – plus Premium Lounges in Sydney, Frankfurt, London Heathrow, Manchester, Dublin, Paris, New York JFK, Washington D.C., and Los Angeles. Its lounges resemble in style and ambience a luxury hotel or private members’ club. They offer guests a tranquil environment where they can relax, re-energise, dine or be entertained, while enjoying the intuitive service and hospitality for which the airline is world-renowned. In its lounges and in the air, Etihad Airways aims to provide a seamless hospitality experience with the same high levels of innovation, care, attention to detail and service delivery guests have come to expect from its people and brand. Now in its 23rd year, the World Travel Awards celebrates excellence across key sectors of the travel and tourism industry. Votes are cast by travel industry executives and travel consumers. The Etihad Airways Premium Lounge at Melbourne Airport opened officially on 9 May 2016. A natural light-filled space with floor-to-ceiling glass, it offers guests expansive views across the runway and surrounding countryside. At more than 800m2 and with seating for up to 133, it is the airline’s largest Premium Lounge outside Abu Dhabi. Blending the essence of a fine-dining restaurant with a chic city cocktail bar, the lounge is a showcase of intelligent design and urban sophistication. Guests enjoy the comfort and luxury of top-quality custom furnishings and the hospitality, culinary excellence and cutting-edge beverage technology, which are the hallmarks of an Etihad Airways Premium Lounge. Its features include an intimate 26-seat dining area and a fully equipped kitchen where a team of professional chefs prepares everything on the premises. The centrepiece is a sculptural showcase bar serving a wide selection of local wines, one-of-a-kind signature cocktails and mocktails developed exclusively for the airline by Fluid Movement, a world-leading London-based mixology consultancy; and more than 70 varieties of spirits. It also has an exclusive space for guests travelling in The Residence, the world’s only private three-room cabin on a commercial aircraft, available only on Etihad Airways’ A380.